With the conscious consumer trend ever growing, Printdesigns is calling on an increasing number of businesses to take sustainability more seriously. As a B2B company offering a number of sustainable marketing products, Printdesigns wants to see a higher take-up of its eco-friendly range. Being sustainable in all areas of the business extends to considering the environmental impact of attending trade shows and exhibitions. While these are great business opportunities, large corporate events tend to have large carbon footprints, so it’s essential that businesses minimise their impact. Printdesigns has released some top tips for exhibitors to be more sustainable. 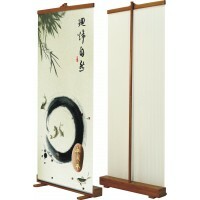 Last year Printdesigns launched its very own exclusive range of fabric display stands. The innovative TEXstyle range is a modern concept and holds many benefits besides being more eco-friendly than a traditional stand. A fabric stand is super lightweight and easy to transport, and the graphics panel is printed in one piece which removes the need for panel joins.